Larry J. Sabato's Crystal Ball » Can President Obama Survive His Economic Record? Can President Obama Survive His Economic Record? The Crystal Ball is pleased this week to feature an essay from Prof. James E. Campbell, UB Distinguished Professor of Political Science at the University at Buffalo, SUNY. Prof. Campbell is one of the nation’s foremost experts in election modeling; he developed the trial-heat and economy presidential election forecasting model (with Ken Wink) in 1990 and also developed a seats-in-trouble forecasting model for House elections that proved to be highly accurate in predicting the 2010 midterm election. As Prof. Campbell himself notes in his piece, he is a Republican, and in his essay he clearly lays out the economic challenges President Obama faces in winning reelection. Forget Bain Capital, tax returns, whether the President says you built your business or not, Fast and Furious, Romneycare, Obamacare, overseas gaffes and the campaign story du jour. These are side issues and distractions. This presidential election should be primarily about one thing, which is the issue that is perennially most important to American voters: the economy. The economy should be center-stage particularly this year because it was the basis for Barack Obama winning the presidency in the first place. Despite widespread dissatisfaction with the later years of the Bush presidency, the John McCain-Obama race of 2008 was quite close until the Wall Street meltdown began in mid-September. As the Gallup data in Table 1 show, Obama held a small lead over McCain until mid-August, and then the race got even tighter. After the conventions, McCain emerged with a small lead. While some of McCain’s convention bump would normally recede in a week or so, the financial crisis and its economic fallout went well beyond this correction. It turned voters squarely against the Republicans as the in-party and sent Barack Obama to the White House. Source: Computed by the author from Gallup polls. Voters in 2008 made Barack Obama the nation’s 44th president to lead in the rebuilding of a healthy economy and out of the Great Recession into a new era of prosperity. This was his mandate. His presidency should be judged by voters on how well he has delivered on this mandate. Their votes in 2012 should be based on whether he has managed the economy well or not — on whether he delivered. So what is the economic record of the Obama presidency? Has he fulfilled his mandate to get the economy on its feet and on the road to prosperity? I think we all know the answer to this question in general, but we can get a better idea of the shape of the economy and how President Obama’s record stacks up compared to past presidents who sought reelection by taking a look at some of the hard numbers compiled by the Bureau of Economic Analysis (BEA). There are a number of ways to look at economic conditions — different measures and different time frames. To be fair, we should look at the record from different angles. The first take is the short-range perspective. As we enter the general election campaign season, how does the economy look? The best overall measure of economic conditions is the real growth in the gross domestic product (GDP). The most recent measure of real GDP growth is from the second quarter (April to June) of this year. This is the quarter that many election forecasters (including myself) rely upon for their forecasts. The BEA’s initial measure of real GDP growth (and they will have two revisions of this before the election) is that the economy grew in the second quarter at an anemic rate of 1.5%. The median growth rate when the economy is not in recession is 3.6%. How does this compare to the election year economies of past presidents running for reelection? 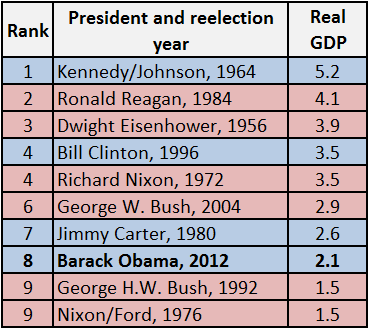 As Table 2 shows, President Obama ranks tenth out of 11 presidents who ran for reelection since the BEA began reporting quarterly GDP data. Only Jimmy Carter had a worse (and disastrous) second quarter economy heading into the election. Taking the limited perspective of economic conditions immediately before the campaign gets into full gear, one must conclude that President Obama comes up well short of delivering on the economic mandate and has fared much worse than other presidents. No president would want to run with such a weak election year economy. Note: Of the nine presidents with better records than Obama’s, seven won and two lost. The one president with a worse record lost. The correlation of the economy and the vote is .67. The second quarter of the election year is politically important, but far from the whole picture. Three months are only 6% of a presidential term. Such a short period may not provide a fair reading of the president’s performance. The full term, however, may not be any fairer. President Obama inherited a deep recession from President Bush. It would be unfair to saddle Obama (or any other president) with the record of the economic mess left behind by his predecessor. For this reason, the appropriate long-range perspective on Obama’s economic record should begin after his first year in office. This has been a common lag in more general examinations of the economic records of presidents. We can chalk up the economic conditions of 2009 to the recession that started under President Bush’s watch. The nonpartisan National Bureau of Economic Research indicates that the recession ended in June of 2009, and it normally takes a couple of quarters for the recovery to get up to speed. So, setting aside the first year, we can examine the Obama record on the economy from 2010 to the second quarter of 2012. This is 10 quarters of economic activity. How does the Obama record look from this longer perspective? Since we do not have quarterly data from 1945, when Harry Truman became president upon the passing of FDR, our comparisons to President Obama are with the nine presidents who have sought reelection since Truman. Table 3 presents the mean economic growth rates of the presidents over the 10 quarters from the first quarter in their second year in office to the second quarter of the reelection year. The mean economic growth during the Obama years has been 2.1%. This places his record at eighth among the 10 presidents in this ranking. Only two presidents, Gerald Ford and George H.W. Bush, had worse overall records than President Obama — and both of them lost their elections. 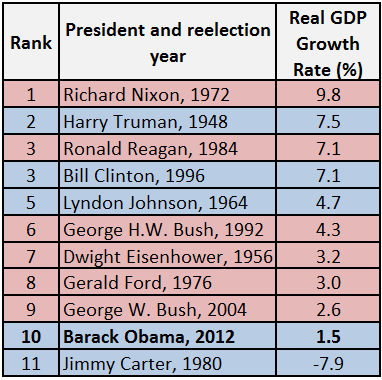 Each president who presided over an economy with an average growth rate greater than 2.7% has gone on to win his election. To date, each president with an economy growing at a slower rate has lost. Note: Each mean is based on the quarterly growth in the 10 quarters from the first quarter of the second year through the second quarter of the fourth year of a presidential term. Of the seven presidents with better records than Obama’s, six won and one lost. Both presidents with worse records lost. Each president with economic growth of over 2.7% was reelected, and each president with economic growth of less than 2.7% was defeated. The correlation of the economy and the vote is .84. What makes matters even more discouraging is that there is no upward trend in the economy over the course of the Obama presidency. A linear regression over time indicates no positive slope or improvement in the numbers. The mean growth in his first four quarters (Q1 to Q4 in 2010) was 2.4%, and the mean growth in the most recent four quarters (Q3 and Q4 of 2011 and Q1 and Q2 of 2012) was about the same, 2.2%. The long and the short of this is that President Obama’s economic record is not one that voters have found to have been acceptable in past presidencies. Whether voters like his ideological positions, or whether they like him personally, it seems quite clear that he has fallen short of fulfilling his mandate to get the economy on the road to prosperity and fallen short of the records of most other presidents. If the election becomes largely a referendum on President Obama’s economic record, it is hard to see how he can win. As I have been setting it out in this essay, the record really speaks for itself. It is dismal, and this is without noting the 42 consecutive months and counting of an unemployment rate over 8%. The only (but crucial) remaining questions are whether the Romney campaign will allow the Obama campaign to toss distractions at the voters to complicate what would appear to be a simple decision, and whether Mitt Romney will be seen by voters as being an acceptable alternative to President Obama. It is hard to say at this point whether the Romney campaign will play it smart. We have experience with candidates playing their cards poorly. Ask ex-President Al Gore. As to Romney’s acceptability, many Republicans resisted Romney as their party’s candidate (and I admit to being one of them), but whatever Mitt Romney is and whatever his many faults are, he is certainly not a radical. He should prove to be acceptable to those voters who cannot bring themselves to vote for four more years of what the objective economic record indicates is a failed president, at least with respect to his economic mandate. Right now, the verdict is out, but it appears that Republicans have been dealt a good hand. Whether they can play it well is what the campaign will test.